On Batesian mimicry from my column with BL-ink last weekend. There's an interesting rhyme to distinguish between the Coral and the Milk Snakes, which I came to know of watching The Jeff Corwin Show, and it goes like this- "Red and black, you're okay, Jack; Red and yellow, you're a dead fellow"! 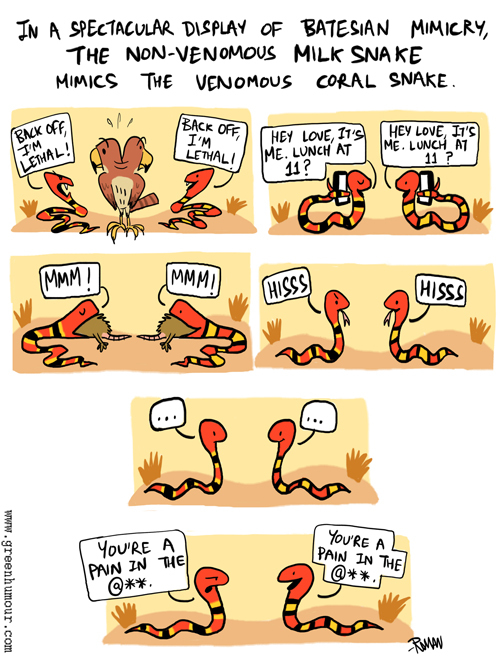 (This pertains only to a few species of North American coral snakes).